This listing is for one gift certificate in the amount of: $50 (US Dollars). This gift certificate will be emailed to you, so you may print it out and give it to your recipient, or you may email it to the recipient. Each gift certificate has a unique code assigned to it which must be used by the recipient at the time of redemption. That code will be listed on the gift certificate that is emailed to you, along with a few simple instructions. This certificate is not redeemable for cash, although any unspent amount may be applied to future purchases. 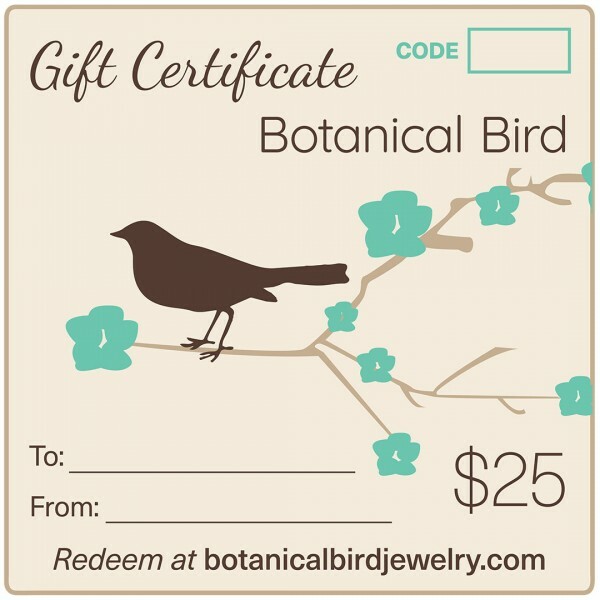 This Gift Certificate is valid only at Botanical Bird’s shop.